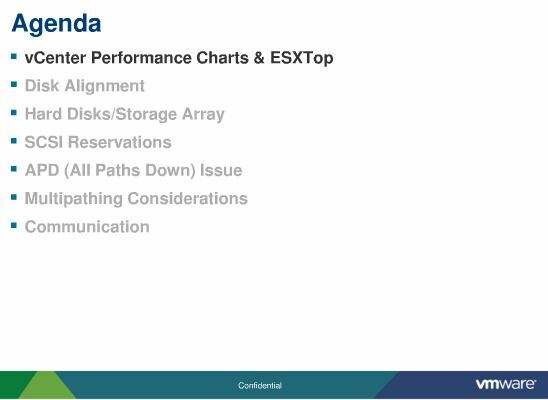 VMware employee Nathan Small of Global Support Services published a very good presentation on troubleshooting performance on vSphere vStorage. The document describes how to read the output given by ESXTop. It stresses the importance of disk alignment to get the most out of your storage array. It discusses SCSI versus SATA drives and a lot more. This kind of documents will give you a lot of knowledge and I think it is a must read for everyone involed in management and design of VMware vSphere infrastructures. The agenda is shown below.